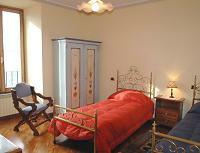 Ancient tufa house in the medieval quarter of Orvieto, enriched with old-fashion forniture. From the rooms an outstanding view of the valley. In Orvieto you can buy Carta Orvieto Unica. 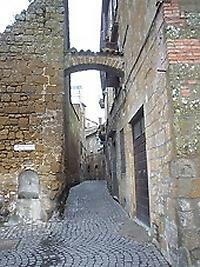 It is an easy and convenient way to visit this splendid medieval city, discovering new and fascinatine aspects. The sights include: the Cathedral, with the frescoes by Signorelli; the archaeological itinerary of the Museo C. Faina; The underground complex of the Cliff with a tour of Orvieto Underground; a climb to the top of the Torre del Moro to see Orvieto from up on high. Pubblic transportation a free round trip funicolar+minibus and many discounts in several shops, reataurants and hotel. Near Orvieto you can visit the Roman Port of Pagliano, an archaeological site 6 km far from Orvieto.This narrow strip of land at the confluence of the Tiber and the Paglia rivers is located within the boundaries of the Tenuta di Corbara. The archaeological site is now open to the public. Then if you want you can visit the cellars of the Estate Tenuta di Corbara, which guests the Port. At the end of the visit you will taste some typical products of the Estate. You can go to Parco dei Sette Frati , in the area of Monte Peglia to make relaxing itineraries. Welcome Bed & Breakfast in Umbria is an association originating in Umbria with the aim of offering tourists a new kind of holiday. We want to help tourists feel that they are participants in Umbrian family life, with accommodation in larger cities or in small medieval villages scattered throughout Umbria. If you wish to discover the beauty of this region Welcome will look after you by organizing your itineraryday by day. Each family will supply you, upon arrival, with brochures, pamphlets, maps of the area and will be able to tell you all you want to know about this territory. They can advise you as to the shops where the most genuine typical products can be bought, the most characteristic restaurants where real Umbrian cuisine can be enjoyed, the artisans who still use old techiniques in their workshops. By turning to Welcome, you will be able to see Umbria through the eyes of its people.